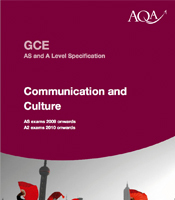 We are not developing a new A-level Communication and Culture qualification due to government changes to A-levels. You may like to consider our new AS and A-levels as an alternative. For example, AS and A-level Sociology available for teaching from September 2015, or AS and A-level Media Studies which we plan to redevelop for teaching in September 2017. Right up until the last exams in 2017 and 2018, A-level Communication and Culture will remain an exciting, dynamic and challenging qualification, and a valuable option for students working at this level. Students of A-level Communication and Culture investigate their own cultural environment and then consider forms of communication and interpretation within and between cultures. opportunities for independent and autonomous study as well as teacher-led case studies. The specification is particularly suitable for 16-18 year olds, providing them with many opportunities to relate their own life experiences to contemporary academic debates. It is also excellent preparation for further study and work. Countless A-level Communication and Culture students have gone on to courses and careers in marketing, public relations, advertising, journalism and more.